Thermalinc: HDD Portable Drum Dolly and Heater! 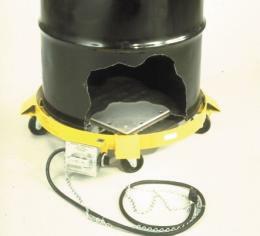 Unique and versatile heater drum dolly is designed for non-flammable, non-hazardous materials. Unit has a 15 1/4" square aluminum heating platen and adjustable infinite heat control. Gives pulsing heat action that prevents improper heat build-up. Dolly rolls on four 3" diameter phenolic swivel casters. Measures 28 1/2" outside diameter x 24" inside diameter x 6" high. Supplied with 6' power cord and plug. Industrial outlet required.